The Abric Romaní site is a large rock shelter located on the north side of the travertine cliff known as Cinglera del Capelló (Capellades, Barcelona). The site was discovered in 1909 by Amador Romaní, who carried out the earliest archaeological work at the site. After a second period of excavations led by Dr. Eduard Ripoll in the 1950’s and 60’s, the current research project started in 1983 and continues to this day. The study of the site is currently based on the excavation of large surface areas in order to construct a spatial interpretation of the archaeological record. Until recently, the stratigraphic sequence was known to be over 20 m thick and was dated by U-series and radiocarbon methods at between 40 and 70 ka BP. However, a recently made mechanical borehole has documented additional deposits, confirming that the talus scree deposits accumulated at the foot of the Abric Romaní escarpment is at least 40 m thick. The sequence is made up of several sedimentary facies, mostly tufa. The archaeological levels are thin layers separated by thick and sterile tufa deposits, which create a clear vertical separation of the living floors. Except for level A, all of the archaeological units in the sequence correspond to the Middle Paleolithic. The upper levels of the sequence (A to E) were largely excavated during former excavations, which does not allow for a consistent approach to determining the spatial distribution of the remains. However, from level H downwards, the archaeological levels have been excavated over large surfaces and have provided a wealth of information concerning spatial organization strategies. The spatial extent of the excavation (over 200 m2) has facilitated the approach to the spatial distribution of the remains. In addition, numerous lithic and bone refits have been found in most levels. 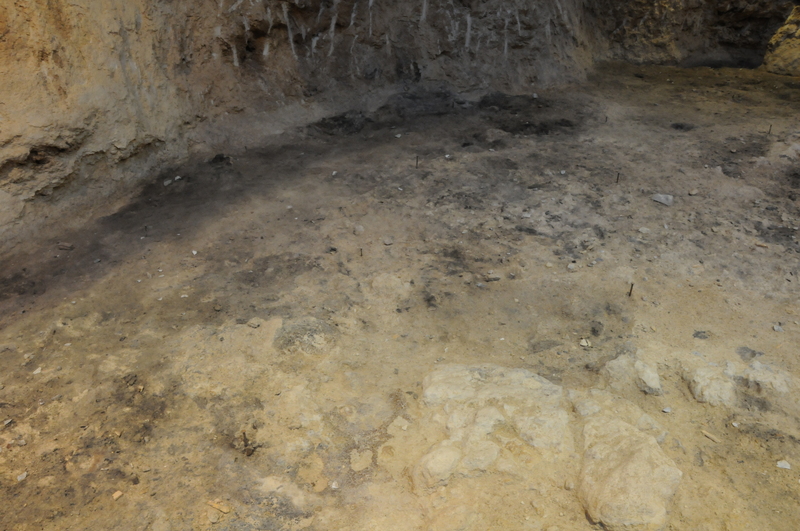 Both the sedimentary conditions and the excavation strategy provide a unique opportunity for high-resolution insight into Neanderthal behaviour. The archaeological assemblages are in a very good state of conservation, including wood imprints and hearths. More than 200 hearths have been identified. The recurrent faunal species found throughout the sequence are Equus ferus and Cervus elaphus, occasionally associated with Stephanorhinus hemithoechus and Bos primigenius. Carnivores are also present, but evidence of their activities at the site is rare and is associated with occasional visits to scavenge the remains left behind by hominin occupants. The raw materials used in lithic production come from the local and semi-local surroundings (maximum 25-28 km) and chert is always the dominant raw material. The goal of the reduction sequences was to obtain mostly small and medium-sized flakes. The predominant knapping strategy is discoidal, regardless of the raw material used, although Levallois artefacts and hierarchical centripetal cores have also been identified. The retouched artefacts are almost exclusively denticulates and notches associated with some scrapers. The preservation of numerous hearths has been used as a proxy in the recognition of activity areas, along with the spatial distribution of the lithic artefacts and faunal remains. Hearths played a central role in spatial organization, as most activities were carried out around them. This gave rise to a spatial pattern characterized by well-defined hearth-related accumulations.